From the Baker Cabin, travel south on Hattan Road, to Gronlund Road. Turn from Gronlund west onto Bradley Road, then south onto Holcomb Boulevard. Follow Holcomb Boulevard to Abernethy Road, then drive west on Abernethy Road to Washington Street, turn right to the three 50-foot-tall wagons and the End of the Oregon Trail Interpretive Center. Follow Highway 211 to Eagle Creek, 6 miles south of Sandy. 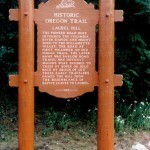 Philip Foster’s place on Eagle Creek was the emigrants’ last stop before reaching Oregon City and the end of the Oregon Trail. Weary pioneers could rest here, buy food, or sample one of Mrs. Foster’s famous home-cooked meals before moving down the road. The (last) Foster house, built in 1882, is on the National Register of Historic Places. Follow Highway 26 into Sandy. Jonsrud Viewpoint is located on Bluff Road one mile north on Highway 26 to the overlook. Meinig Park: just south of Highway 26. Jonsrud Viewpoint provides a spectacular overlook of the Barlow Road’s route from Mount Hood to the Sandy River. Three interpretive signs describe the route, the emigrants’ efforts to cross those last mountains and rivers, and the Barlow Road toll station that was operated here. On Highway 26 near mile post 40, west of Welches. Emigrants camped either at Rhododendron or west of here beside the Sandy River. After 1847, almost all emigrants traveled through Wildwood before crossing to the north bank of the Sandy River. On Highway 26 between mile posts 44 and 45. The West Barlow Tollgate in Rhododendron was the last toll gate operated on theBarlow Road (1879-1919). A replica of the original gate stands between two maple trees planted by Daniel Parker, gate keeper from 1883 to 1902. On Highway 26 at mile post 53 on the Government Camp Business Route.